Search your library for two basic land cards, reveal them, and shuffle your library. Put one of them into your hand and the other on top of your library. Probably! But it's my entry nonetheless. I'm fine with not winning, but if I think of something better, I'll change it. 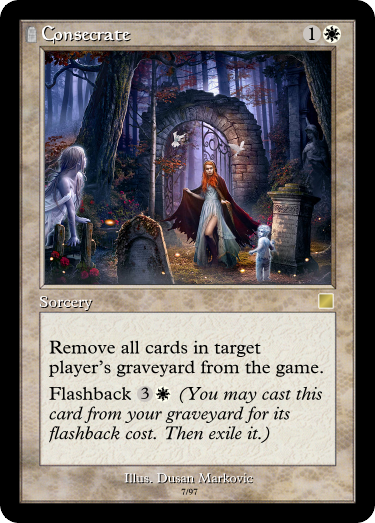 When ~ dies, it deals damage equal to the number of +1/+1 counters on it to target creature or player. Thanks for the reminder! This contest will be judged in one (1) day. Get your last entries in. 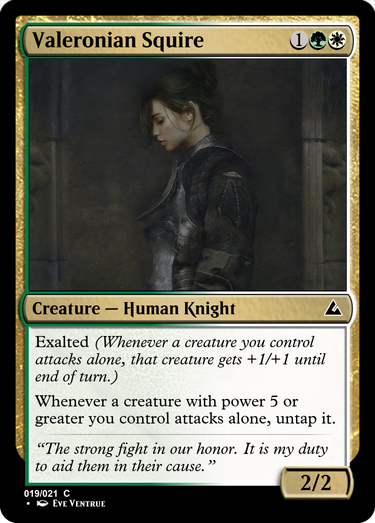 Since mixing together different shards was a theme of Alara Reborn, I decided to go with an exalted card that gives you a boost for having power 5 or greater, mixing together Bant and Naya themes. Friendly reminder for Fleur de Violet. Neottolemo: Reminds me of mining mana from Daji's Karsus project. 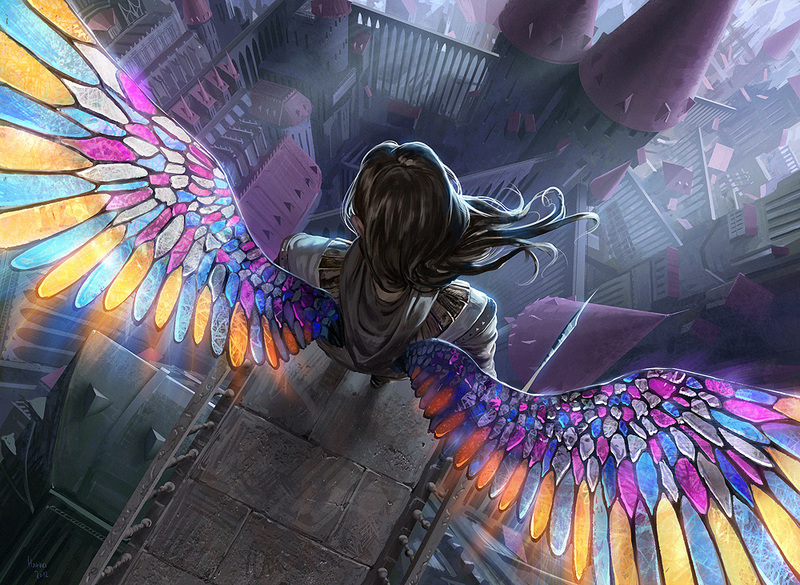 Other than that, I think this a pretty great way of solving the "no one drops" issue while still staying in the spirit of the multicolor theme of Alara Reborn. Tesagk: Too complicated for common. The other problem with this is that it also has too much text for common (I plugged this in earlier, and it was I think 8 or 9 lines of text? Not okay.) Power-wise, the modes are too disparate - the white mode is comparatively trash compared to everything else there. Overall, the parasitic name-checking and complexity make this a not good design. gluestick248: First of all, love the flavor text. Now for the actual card itself: I think it could be a little bit better. Then again, Fork in the Road says that maybe this is fine power-wise, but this is gonna be a tough pick against things with basic landcycling, which are less color intensive and which serve non-mana related functions. Overall a good design - just might need to be a bit stronger. monger: Cute! I'm hesistant at putting large fliers at common, but the ease that one can remove this makes me a bit less wary. Anyways, this is a cool design that leaks some nice Alara flavor(TM). gateways7: One thing - I'd like it more if it checked the power of the creature after attacking so that you could untap it based on its power after exalted bonuses. Barring that, this is a sweet way to combine two shards. Winner is monger, with gateways7 as a runner-up. Thanks for participating, y'all! Tesagk : Too complicated for common. The other problem with this is that it also has too much text for common (I plugged this in earlier, and it was I think 8 or 9 lines of text? Not okay.) Power-wise, the modes are too disparate - the white mode is comparatively trash compared to everything else there. Overall, the parasitic name-checking and complexity make this a not good design. The next set is Theros! The additional restriction is that your card cannot have only the creature card type- noncreatures are obviously fine, but any creatures must be enchantment or artifact creatures. Great! I'll submit an entry soon. supertypes. They are only enchantments. when that creature leaves the battlefield. I believe this one is coming up to a close, but it's ultimately up to monger. : Return Nylea’s Gift to its owner’s hand. You gain 3 life. Heroic - Whenever you cast a spell that targets Polis Guardsman, draw a card, then instants, sorceries, and Auras you own cost 1 less to cast until the end of the turn. "Ephara's light shines within me, blessing me with the knowledge to help my city and the strength to keep it safe." EDIT: I made the card at 6:30 in the morning, I was tired, I forgot. Fixed. The additional restriction is that your card cannot have only the creature card type- noncreatures are obviously fine, but any creatures must be enchantment or artifact creatures. gluestick248 : could you edit rarity into your entry? The cost is interesting- I like how it influences deckbuilding, since it’s six mana in a two color deck but only four in a three color deck. 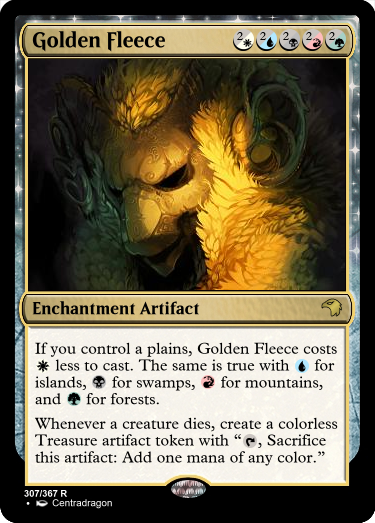 The Golden Fleece is a little difficult to represent top-down since I think it’s left ambiguous as to why the Fleece is so desired, but I like the ability nevertheless. 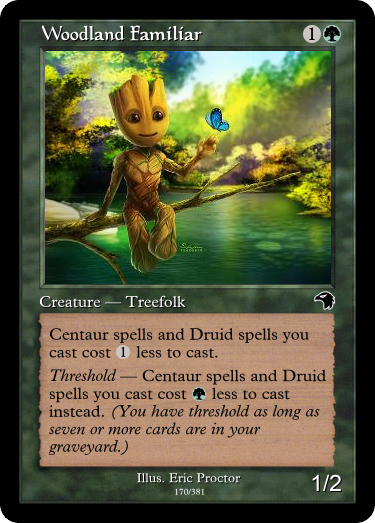 At the same time, I think it’s a bit of an awkward fit for Theros and for its own types. 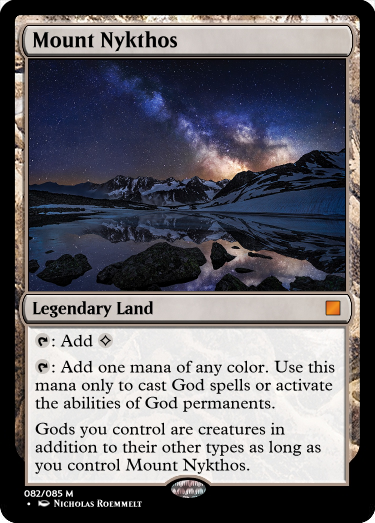 It pushes for multicolored decks in a set with devotion as a key theme. The God’s Weapons cycle felt like they deserved the status of Enchantment Artifact (static + activated), but apart from the physical nature about the fleece the card could just have the enchantment type. also feels like it’s missing the legendary supertype. To start, I liked Fated a lot. I wasn’t a very big fan of legendary instant/sorceries, but fated presents a slightly different question that, while still significant, isn’t as massive of a hoop as legendary sorc were. I think the card itself is in a bit of an odd spot- typically hate cards want to come down early, but Insurgency is 4cmc and requires three creatures/etc to have an impact. It can do a lot of damage against a bestow-heavy deck, but bestow was never really a constructed strategy and in limited the effect is rather narrow. Caring about gods makes sense for a Mount Olympus inspired card. The last ability likely takes it too far, though- in format where it’s tutorable, the ability to toss out indestructible 5/5s starting on turn 3 is a little much. That’s partially on the gods for being hard to deal with once animated, but the animation itself is meant to be difficult. A nice cheap heroic enabler that would also have future-synergy with constellation in Journey into Nyx. Trample is a good keyword to grant, especially since green heroic creatures tend to grow big, and the life is a solid bonus as well. While it wouldn’t break limited it would be a very high pick for a number of green decks- limiting the activated ability would make it more safe. I like the heroic effect- drawing cards is clearly good, but the cost reduction helps you have larger turns in the lategame. The main concern is that it doesn’t feel like an enchantment creature, an issue exacerbated that you get the most value out of it by treating it like a creature. Neat find- I don’t think this concept was touched by Theros (maybe bc Hercules wasn’t?). I don’t like how this card turned out, though. 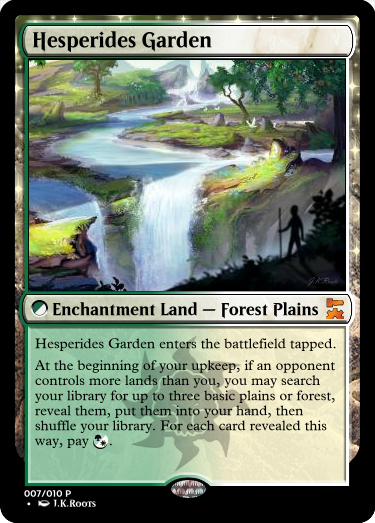 If this was just an Enchantment Land- Forest Plains that etb tapped that would already be a solid card, but introducing the triggered ability is a little much. The triggered ability isn’t even incredibly good, just worth activating once or twice, but it pushes a card that was already playable into the “very solid” range. …but the best was gluestick248! Thanks monger for the win! Now, the next challenge is to make a card for Torment. As your additional restriction, your card can’t be black. Fair cop, monger . The design was a leftover idea from another contest that I couldn't submit because I was judging. In all honesty, I knew it probably should have been legendary with the mana gen as an ability, or something. I put on the Land Tax effect to play up the enchantment aspect, and then scaled it back to account for Enchantment Land making it more valuable already. I decided to go as close to how it would have been printed back in the day as I could. Cool. monger, thanks for the runner-up, I know how you feel about the number of entries, still hoping the idea will catch on. I'll submit my entry later. Flavor: I figured I'd use an angel since they were there in the lore. Flashback came out in Torment, and I figured I'd boost up the Angel's power given its mana cost, by adding a 3 CMC bomb anyone can activate. 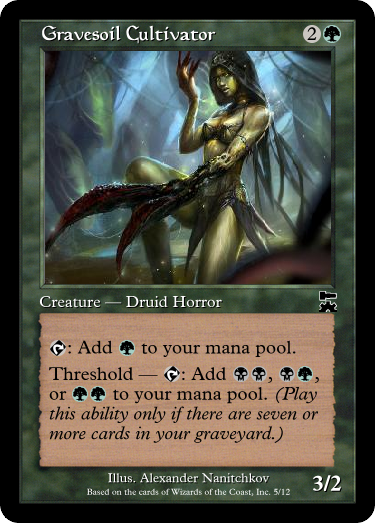 When ~ comes into play, it deals 1 damage to each nonblack creature. He who had charred many a foe was helpless against the horrors that encircled his tribe.